Map of vicinity of Port Louis. Ink and watercolour on paper. The map was subsequently printed as Intelligence Division, War Office, No.1730. -- 'Capt Harrison i/c Survey Sect' ― War Office catalogue. Harrison, William Albert. 1 : 14256000 Colton, G.W. Iles des Amis. Oceanique no. 47. 1 : 14100000 Montemont, A. 1 : 14400000 Migeon, J. South part of Africa and Magadascar. Africa - South. Pergamon World Atlas. 1 : 16600000 Sharpe, J. 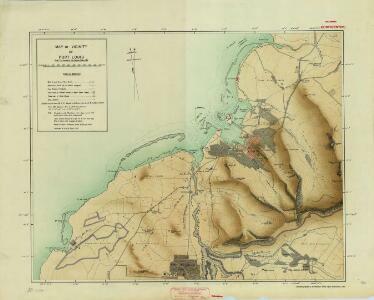 Description: Map of vicinity of Port Louis. Ink and watercolour on paper. The map was subsequently printed as Intelligence Division, War Office, No.1730. -- 'Capt Harrison i/c Survey Sect' ― War Office catalogue.